This Braided Pizza Loaf is the perfect recipe for busy nights. We love making these on Fridays, and my little kitchen helpers love adding their favorite pizza toppings. It's easy to make and tastes amazing. Once again, my pregnant body is craving pizza (we are averaging pizza for 2 meals a week these days…yikes, I know). I came up with a new twist on pizza that my whole family loved. It was also incredibly easy and fun to make. It’s the perfect dinner to get the little ones involved with. 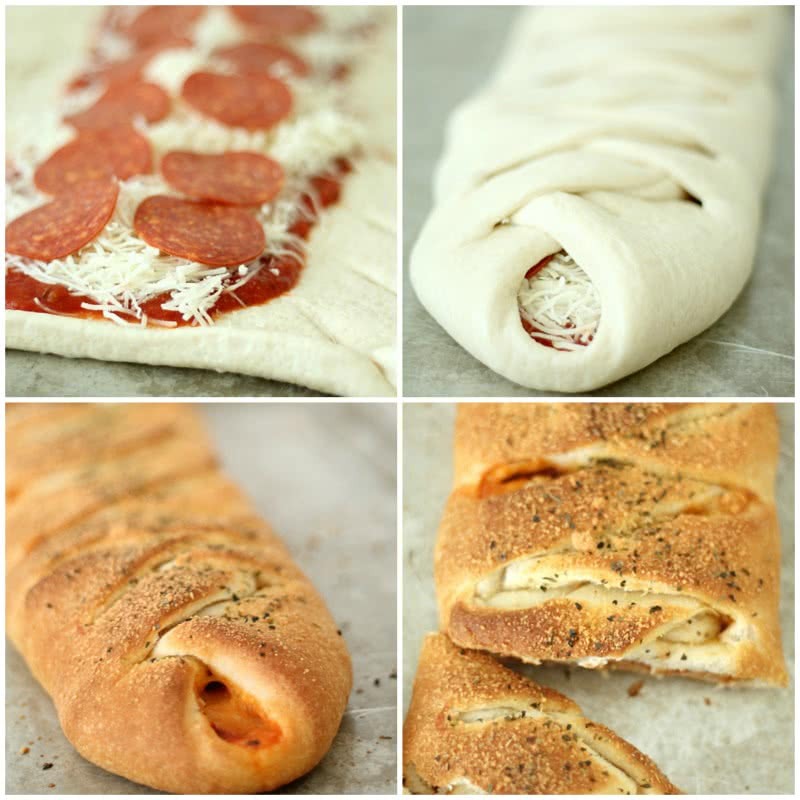 They will love adding in their favorite toppings, and watching you braid the pizza loaf. My kids were mesmerized. 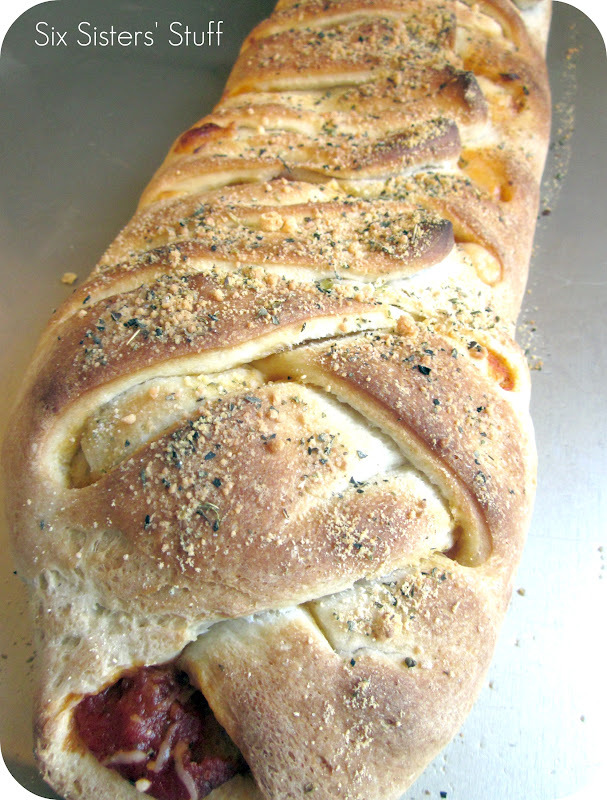 If you are looking for a simple and quick dinner idea, we highly recommend this Braided Pizza Loaf. I promise, it will not disappoint. what other pizza combinations could I make with this? I love all kinds of pizza. The thing I love about this recipe is how versatile it is. 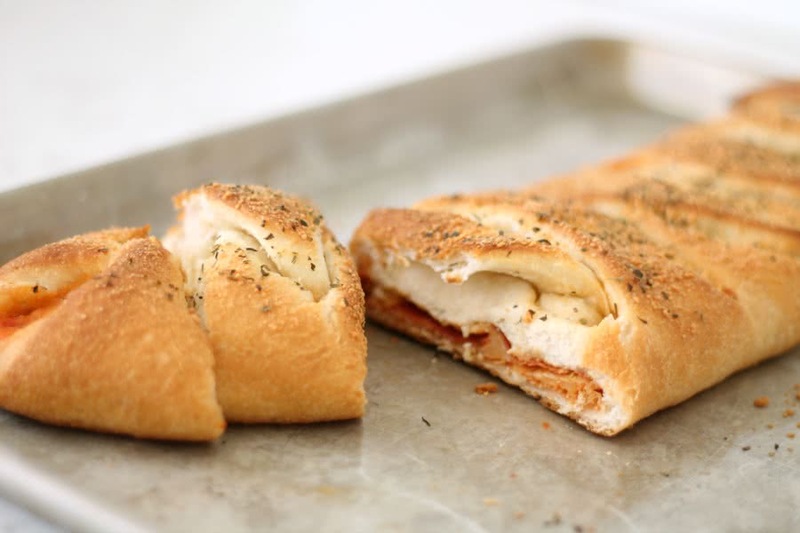 You can make your pizza loaf, with your favorite flavor of pizza. You could even do half one flavor, then the other half another flavor. Combination (olives, sausage, mushrooms, bell peppers, onions, etc.). Buffalo Chicken (we use a ranch base or Alfredo sauce base). I am all about shortcuts and I love this recipe, because the store-bought pizza dough works perfectly and is already in the shape I need it to be. However, you could easily make your own pizza dough. I highly recommend trying our Papa John’s Copycat Pizza Recipe. Unroll pizza dough on a greased baking sheet. Spread pizza sauce down the middle of your dough. Add mozzarella cheese and pepperoni on top of sauce. Cut 1-inch diagonal strips up each side of the dough. Fold 1-inch strips up and over pizza filling, alternating sides to get a braided look. Let cool for a few minutes then cut into slices and serve. 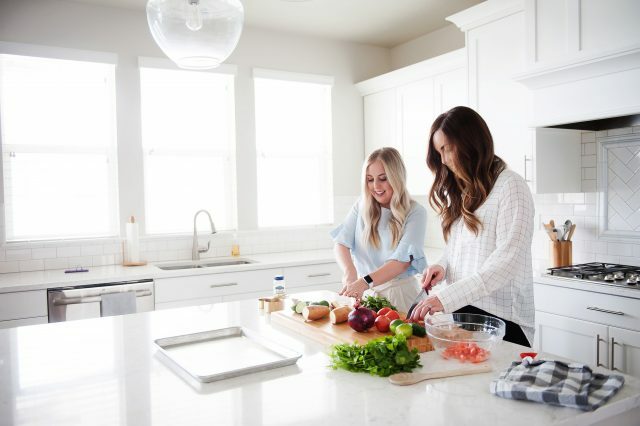 All of our recipes are family-friendly and we have been developing these recipes for the last 5 years! You can read more about it and JOIN HERE! For as little as $3 a month, you can take the stress out of dinnertime! It is free to cancel at anytime, so it’s worth a shot at making your life easier! Awesome, I have got to try it. Thanks for breaking it down so it's not so complicated! Pinned this! Yum, I love a good twist on pizza! Oh my goodness! I remember making this in our foods class in high school and I still remember how GOOD and DELICIOUS it was! Glad you resurfaced that memory for me! oohhh I'm sooo trying this next time!! Do you use all-purpose flour in your dough? I switched to 00 grade flour in my pizza dough and it makes such a difference. Our favourite topping is caramelised onion and goats cheese. I am making this tonight!!! Thank you!!!!! Mmmm this looks so good. We eat pizza so much, and I dont have a pregnancy to excuse myself for that. we've made a goal to not eat pizza for 3 weeks, because normally we have it twice a week, but once we are done I will most definitely be making this. Yum! This looks amazing! I'm pinning it to use later. My husband loves pizza so this will be great. This looks SO yummy! I love how you brushed the top. Again, mouth watering! Thanks for sharing at oopsey daisy! I made this on Friday night for my family and they LOVED it! My canned pizza dough was expired (embarrassingly so) but I used my favorite quick, easy dough recipe and rolled it out into a rectangular shape and it worked great! Everyone said it was better than take out pizza. Definitely a keeper! WE LOVE pizza in our house. IF you want, come over and link this to my Must Try Monday link party right now. I am going to pin this to my "pizza" board :). We love this unique concept for pizza! We weren't big fans of the pre made refrigerated pizza dough, so next time we will use homemade dough, but we WILL be making this again! Have made it twice (it's in the oven right now). The family loves it! Thanks for such a fun and easy recipe. I just found this recipe, (I know, I know, it's been up for over a year) Anyway, I am looking forward to trying it but was wondering if it freezes well? Can I make them ahead of time and freeze them for a rainy day (so to speak)? If so, would you bake it first and then freeze? Thanks!